NEWFOUNDLAND – Anaconda Mining of Toronto has received approval from the provincial department of natural resources to use the Pine Cove pit at the Point Rousse project for tailings management. Up to 7 million tonnes will be stored there. Anaconda says it will accelerate mining at the bottom of the Pine Cove pit and stockpile the ore so that the tailings storage facility can be put into service early next year. The company says using the pit carries less technical and environmental risk than building a conventional tails pond. Furthermore, the company estimates there is a capital expenditure saving of between $35 million and $70 million in using the pit rather than building a new facility. Over the next two years, the Pine Cove mill will treat ore from both its namesake pit and the Stog’er Tight gold deposit, under development 3.5 km away. 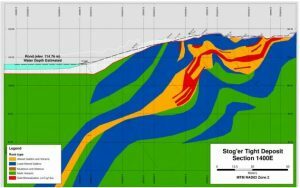 There is also potential to outline a minable resource at the Argyle discovery 4.5 km from the mill and the high grade Goldboro property in Nova Scotia.